"The sideshows don't matter," Carney said. The American people matter. Jobs matter." that he will be completed before kick-off,"
We have a date for President Obama's speech on joblessness -- Thursday, Sept. 8. What we don't have is a specific time -- though we know he will be done by 8:30 p.m., which happens to be the start time for the season-opening pro football game between the Green Bay Packers and the New Orleans Saints. 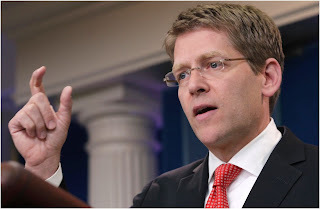 Carney said Obama and aides are looking forward to speaking directly to Congress, and not rehashing the remarkable political flap that preceded the scheduling of the speech. Obama initially asked to speak to a joint session of Congress on Wednesday. Some Republicans objected, noting their presidential candidates have a debate that same night; House Speaker John Boehner, R-Ohio, suggested the president move the speech to Thursday, citing logistical concerns. After talks between the White House and Boehner's office, Obama opted for Thursday. "The sideshows don't matter," Carney said. "The economy matters. The American people matter. Jobs matter." "It is irrelevant," Carney later said. "It really is." It also didn't bother the president, Carney said. "I spent a great deal of time with him this morning and it never came up," Carney said. "Honestly." Carney said Obama wanted to speak to Congress about about as soon as lawmakers got back from August recess. "Wednesday seemed to be the best option," he said. "When that seemed to be a problem, Thursday was fine with us." The White House has long been mindful that Thursday night also features the season opener for the National Football League, New Orleans at Green Bay. When a reporter asked Carney if the speech will constitute a "pre-game show," the spokesman said: "It means he will have the opportunity to watch the game, like millions of other Americans."